One more point of interest about The Trip to Tilsit. Playing the philandering husband (and also good) was a Dutch actor named Hein van der Niet, billed as Frits von Dongen. Unlike his director, van der Niet fled the Nazis at the outbreak of World War II and wound up in Hollywood working as a freelance actor under the name Philip Dorn. He was Hal Wallis’s first choice to play Victor Laszlo in Casablanca — personally, I say it’s a pity he didn’t — but he had already signed for Random Harvest at MGM and the scheduling wouldn’t work. No telling how Dorn’s career might have gone if he had done Casablanca instead of Paul Henreid, but as it was he still managed to rack up a pretty good career — Ziegfeld Girl, Tarzan’s Secret Treasure, Calling Dr. Gillespie, Passage to Marseilles and The Fighting Kentuckian, among others (he was especially fine as Irene Dunne’s husband in I Remember Mama) — before ill-health forced his retirement in 1955. He died in Los Angeles 20 years later, age 73. 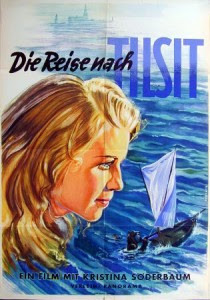 After “the Nazi Sunrise” it was back to Hollywood and the English language for Every Night at Eight (1935), a well-above-average musical from Paramount. 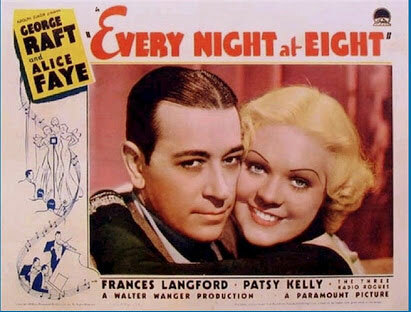 George Raft and Alice Faye (on loan from 20th Century Fox) were top-billed, but the prime role went to radio singer Frances Langford, in her feature debut. Alice and Frances played two of three pals (the third was Patsy Kelly) seeking and finding radio stardom with bandleader Raft. Raoul Walsh, better known for movies like High Sierra, They Died With Their Boots On and White Heat, directed at a lively pace, and there was a bunch of first-rate songs, two of which are still with us: “I Feel a Song Comin’ On” and “I’m in the Mood for Love”. 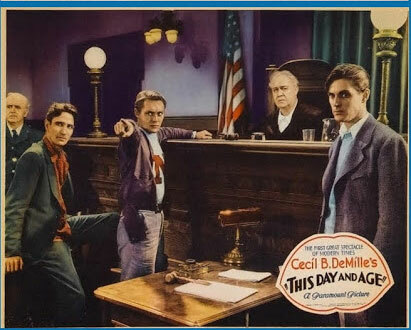 …And then came Cecil B. DeMille’s This Day and Age (1933). Talk about a curiosity! Richard Cromwell plays the leader of a group of high school students who get appointed to ceremonial positions in city government — judge, chief of police, district attorney, etc. — as a way to give them an on-the-job view of how the grownups run things. When a friend of theirs is murdered by a local gangster (Charles Bickford) who gets off scot-free thanks to an oily high-priced attorney, the kids take over the government for real, kidnapping the gangster and torturing a confession out of him (“We haven’t got time for rules of evidence!”), after which the adults see the error of their ways. The trauma of the Great Depression spawned more than one movie like this — check out a little oddity called Gabriel Over the White House (’33) sometime — movies where audiences could vent their frustrtion with “the System” by vicariously experiencing things they’d never get away with (or seriously contemplate) in real life. I’m going to cut this post short in the interest of getting it up. But stay tuned; we’re not even halfway through the weekend, and there’s more where this came from.